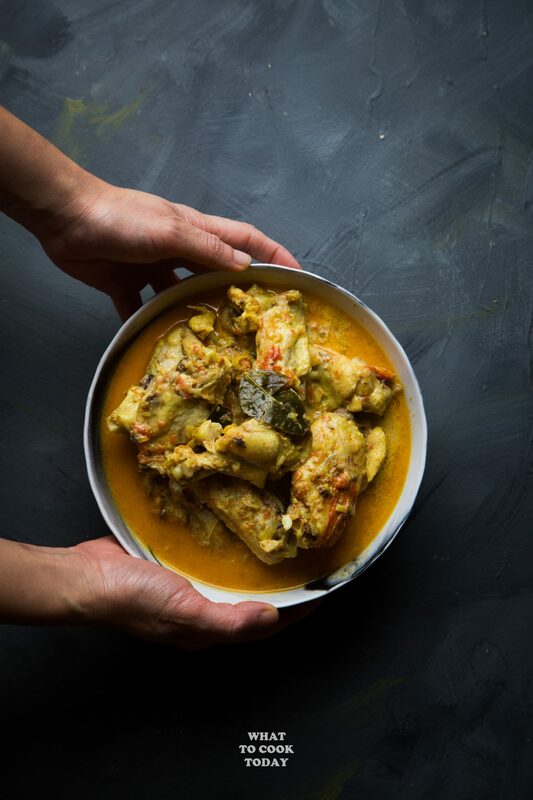 The popular Indonesian Curry Chicken (Kari Ayam) is pressure-cooked in the multi-purpose Instant Pot and fall-off-the-bone meat in a fraction of the time! Yes, I have joined the Instant Pot Cult! Not sponsored you guys! I purchased it because I’m curious to try out this magic pot that people have been raving about in the foodie communities. My first exposure to Instant Pot was last year when I saw a friend of mine posted on her Instagram on various meals she prepared using Instant Pot. I was like…whatever! Just another gimmick that probably will die off in a year or two! Only that it doesn’t. This thing is so popular now that when I walked into Target on two separate occasions, I saw two moms had Instant Pot in their shopping carts. Immediately, it sent me into thinking…huh, this must be a sign that I need to give this magic pot a try and well…you know how the story goes from here. 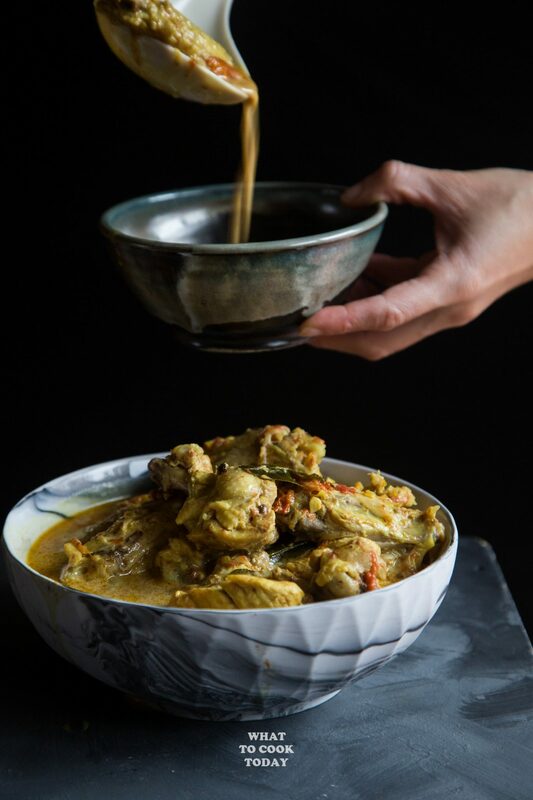 Here’s the first recipe I shared on this blog using Instant Pot, Indonesian Curry Chicken or we call it Kari Ayam.I’ve made Kari Ayam before without Instant Pot and so I wanted to compare how it’s like using Instant Pot to prepare it. 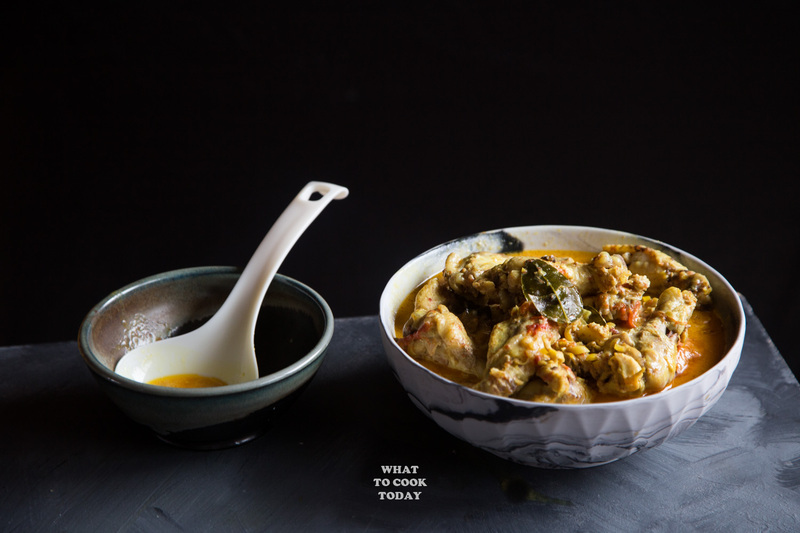 I simplified the recipe a little bit for this Instant Pot version as I know the majority of people who own Instant Pot seek convenience and can’t be bothered to go hunting for turmeric leaves and galangal roots 😉 If you know what I mean! 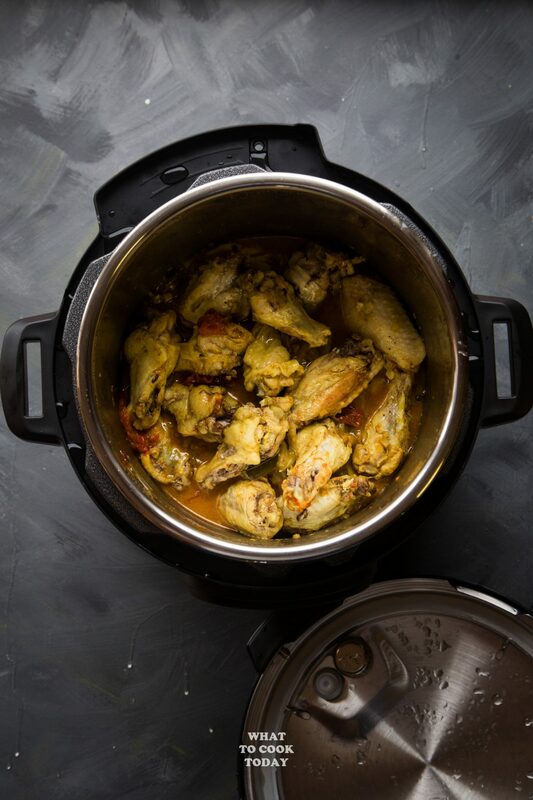 But, you won’t be disappointed by this Instant Pot version. It tastes so good and makes you feel like you spend lots of time making this. My husband loved it! WHAT I LIKE ABOUT USING INSTANT POT TO PREPARE THIS? 2. I don’t know about you, but I had always felt a bit intimidated by using a pressure cooker, but the pressure cooker feature in Instant Pot is easy enough for a dummy like me to operate without having to injure myself! 2. Chicken is fall-off-the-bone tender in 15 minutes. I usually cook it for close to 1 hour on stove-top. EVER WONDER WHY YOUR CURRY THAT HAS COCONUT MILK IS FROTHY OR NOT SMOOTH? Because you boil the coconut milk/cream. 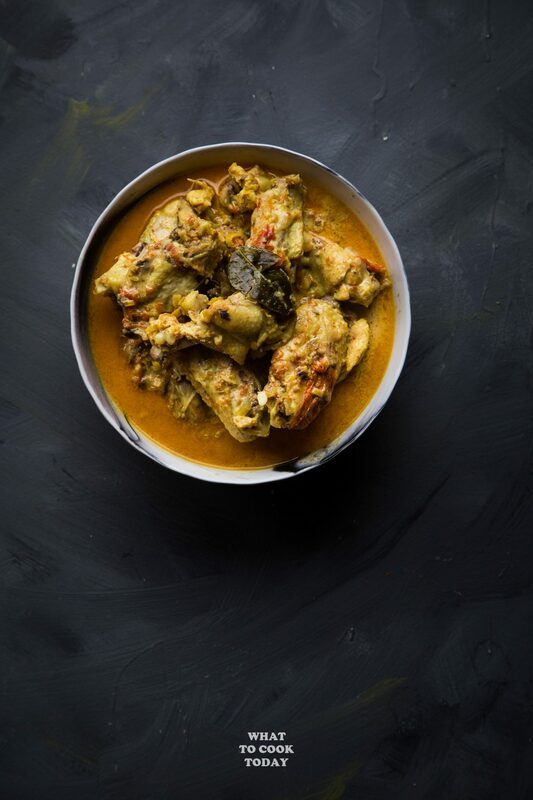 Once it’s boiled, coconut milk will turn frothy and makes your curry not smooth anymore. I added the coconut cream at the end of cooking time once it’s done pressurized. This is one of the tips that my moms keep reminding me when cooking with coconut milk, whether you do it with Instant Pot or stove-top. 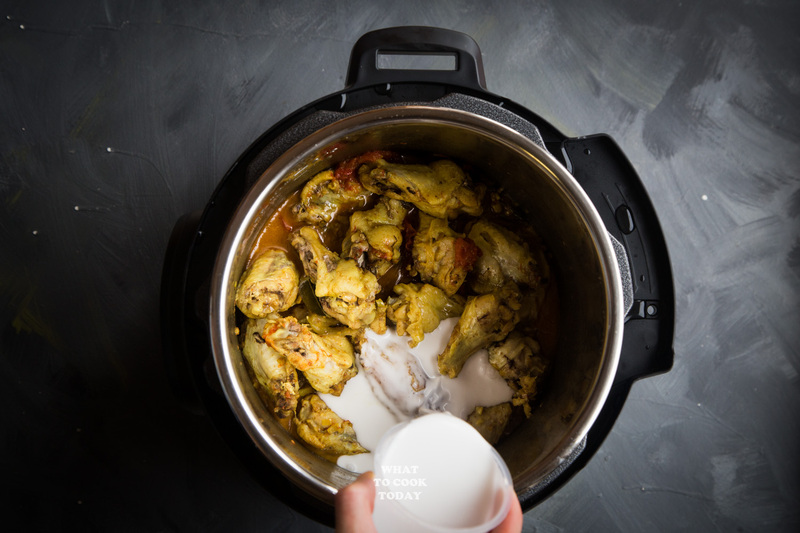 Never boil the coconut milk on high heat, unless you are making something like Rendang, in which the meat is slowly cooked along with coconut milk. 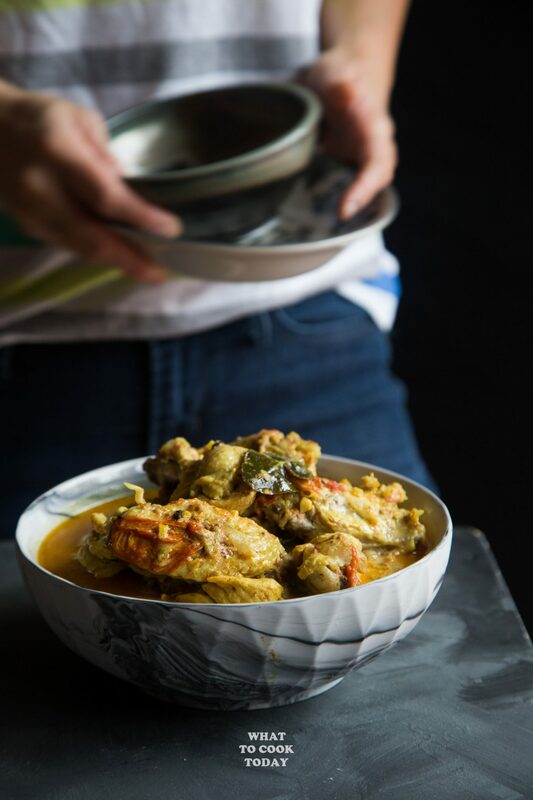 I love how the Kari Ayam turned out. The meat was still tender and fall-off-the-bone in half the time! Pretty impressive! I will be Instant Potting A LOT you guys! 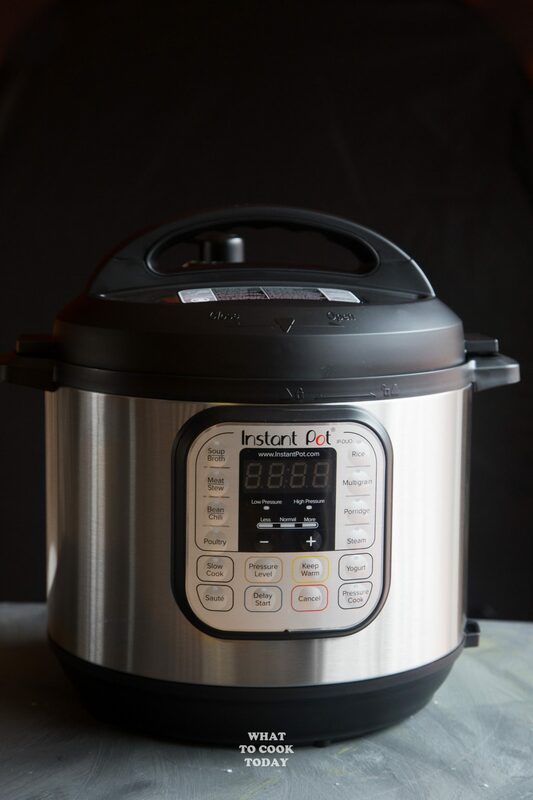 But fret not, I’m not trying to sell you, if you don’t have Instant Pot, I will still include the regular cooking method without Instant Pot in every recipe (if there isn’t one already). 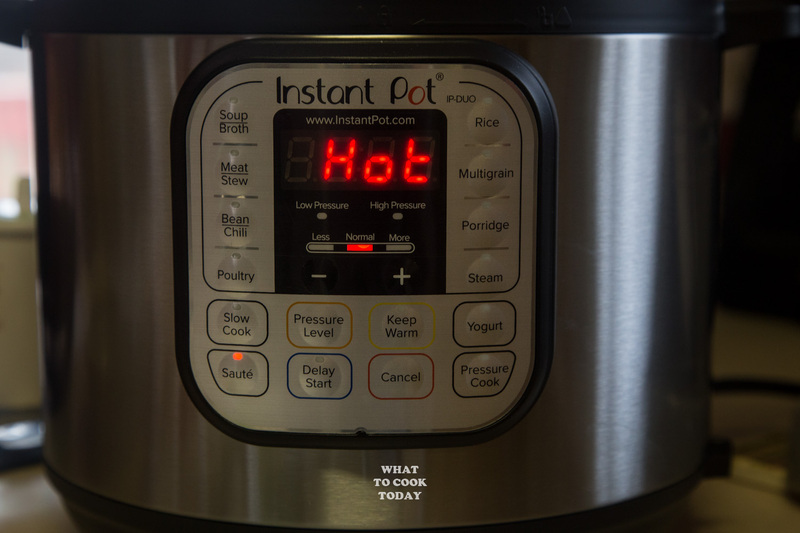 Turn on the Saute mode on the instant pot, when it displays HOT, add in cooking oil. Add onion and garlic and saute until they are soft and fragrant, about 1 minute. Add star anise, kaffir lime leaves, curry leaves, turmeric powder and stir fry for another minute. Add the chicken pieces in there and stir to mix everything. Pour in the water. Add tomatoes. Close the lid of the Instant Pot. Make sure the steam release handle is turned to SEALED. Press the Pressure Cooker button and use the -/+ button to set it to 15 minutes. The pressure mode takes about 5 minutes to get "ready" before it will start the actual cooking time. At the end of cooking time, use "Quick Release Pressure" method. Turn the steam release handle to VENTING and wait to let it releases all the steam and pressure, it will make that "hissing" sound. Once you don't hear that anymore, make sure the float valve near the steam release handle is all the way down (usually it is). If it's still up, wait! It's still pressurized. This recipe looks great. Can you please provide the weight of the chicken? In general it’s helpful to give weight of ingredients instead of quantity that could vary greatly in weight. Yes, I agree the weight is more helpful. I’ve updated the recipes. It’s about 2.5 to 3 lbs chicken. Please let me know how they turn out if you give it a try. Thank you so much. My wife was missing Indonesian food. I have an instant pot mini I wanted to use. 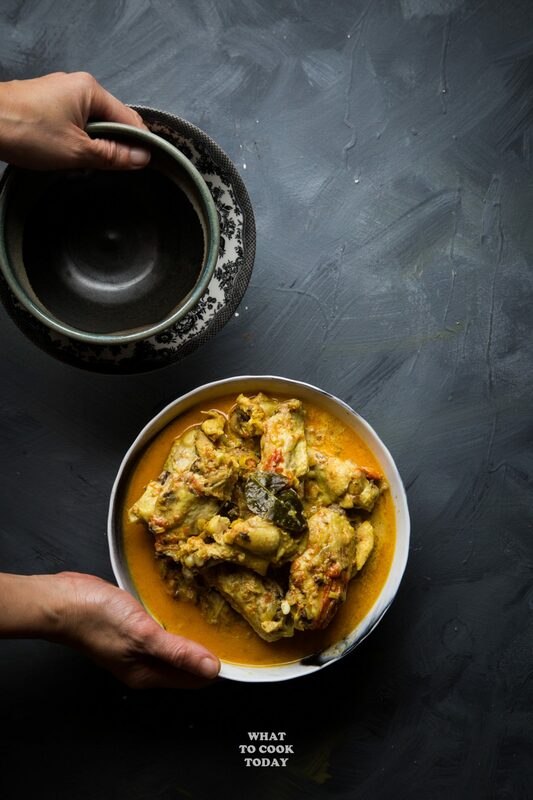 I made this recipe and she loves it, (and says it tastes more like “gule ayam padang”). The ingredients for 6 people fit my instant pot. I added a bit of ginger, too. Hi Scott, I’m glad your wife likes it. 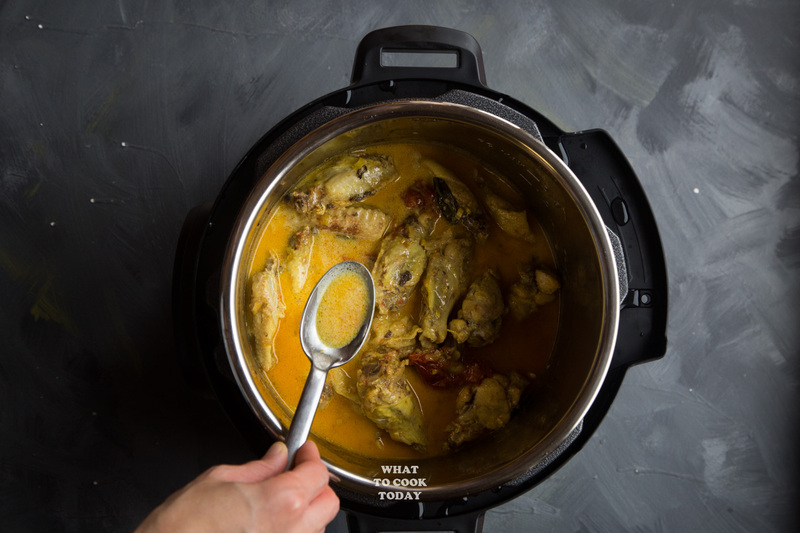 This version for Instant Pot is much more simplified and may “alter” the taste. 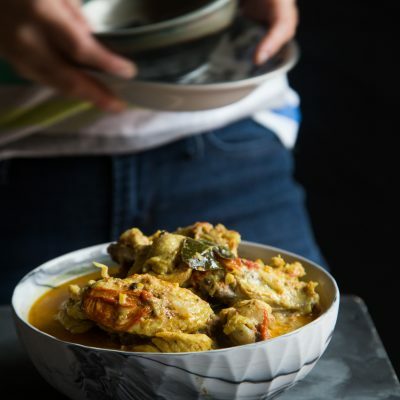 If you are interested, you may take a look at this version https://whattocooktoday.com/kari-ayam.html. Thank you so much for letting me know! Love this! Can you add other vegetables to the instant pot including mushrooms, eggplants, okra, and cabbage? Oh yes, you absolutely can! in facts all those that you mentioned would be perfect to cook along with the chicken.